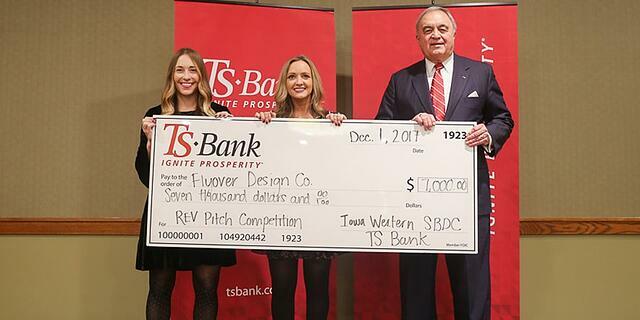 Council Bluffs, Iowa, Dec. 5, 2017 - On Friday, Dec. 1, TS Bank held their third annual small business pitch competition event, REV, with a goal to ignite small businesses. The event, held at The Venue inside Harrah’s Casino in Council Bluffs, Iowa, had a prize total of $27,000, TS Bank contributing $25,000, and Revela of Omaha with an additional $2,000. Five small businesses were given five minutes to pitch their business plans to a panel of four judges in front of a live audience. The final five competing businesses were: Appsky Labs of Omaha, Nebraska; Flyover Design Co. of Des Moines, Iowa; Found of Omaha, Nebraska; Fyiio of Omaha, Nebraska, and HomeDitty of Des Moines, Iowa. Appsky Labs was awarded $10,000; Flyover Design Co. won $7,000, HomeDitty was awarded $5,000 and Fiiyo and Found Vintage each won $2,500. TS Bank selected four judges as experts in their field and to represent the local community.  The panel of judges consisted of Andrea Fredrickson, the CEO of Revela of Omaha; Allie Esch, an associate at Dundee Venture Capital of Omaha; Dan Koenig, president of the Council Bluffs Chamber of Commerce; and Nathan Preheim, co-founder of The Startup Collaborative. TS Bank hosts this event in alignment with its mission to reinvest 10 percent of its pre-tax income back into the community. Early in TS Bank’s history, a powerful realization was made: a community’s success is based on the strength of its small businesses. The newest component of this commitment to local businesses was the creation of REV in 2015. Since then a total of $79,500 has been distributed to small businesses through this event. Previous top winners include BEX International, LLC, Mulholland Grocery, Inc., Zinnia, Stickalicious Pops, Terva, FlightBrite and Leinwaivers.io. 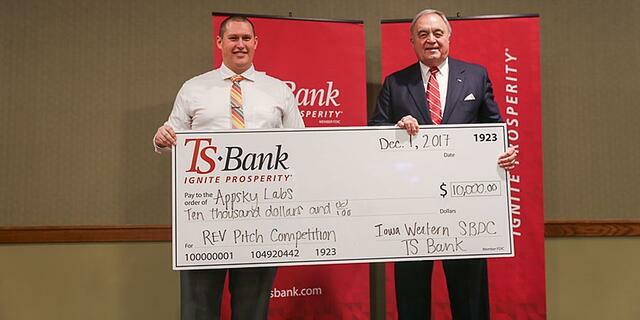 This year’s prize money was distributed in partnership with the Iowa Western Small Business Development Center. 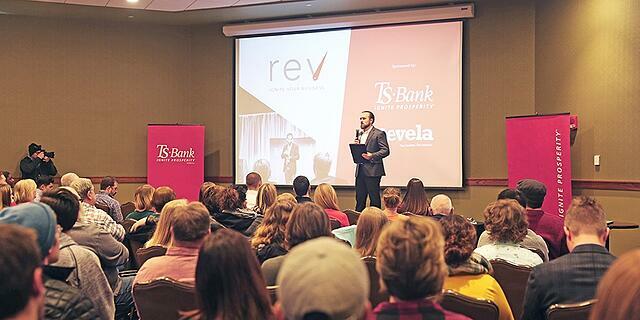 For more information about REV, and to see all past winners, visit tsbankrev.com or call (712) 487-3000. TS Bank’s mission is to Ignite Prosperity® in the communities it serves. Leading the resurgence of community banking, TS Bank reinvests 10% of their net income locally; hosting educational events and partners with local organizations and non-profits. Treynor State Bank was chartered in 1923 and branded to TS Bank in 2005. 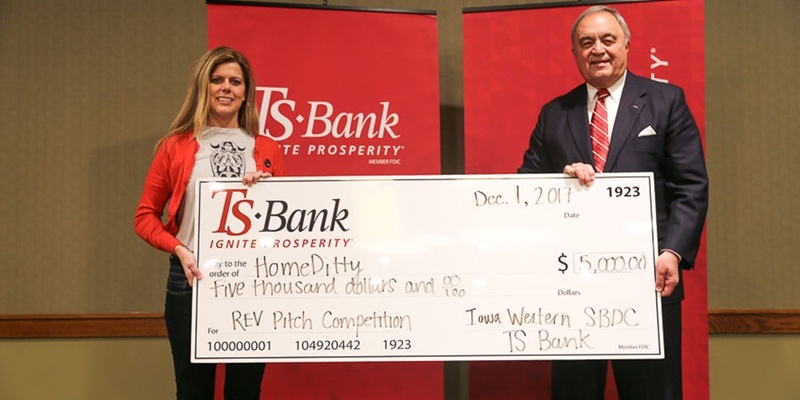 TS Bank has $400 million in assets, along with the largest Iowa state-chartered C-Corp trust department west of Des Moines at nearly $290 million in assets named TS Prosperity Group. Branch locations include Treynor, Macedonia, Atlantic, Corning and Council Bluffs, Iowa. For more information visit tsbank.com.